Your suspension helps you control your vehicle and provides a comfortable ride over varying road surfaces. If your vehicle bounces a lot after driving over a bump, or is generally hard to control, you may need new suspension parts. Are exercising your right as a motorist. Will face no negative consequences. If a law enforcement officer instructs you to take an alcohol test, you are compelled by law to do so. You may lose your driver license if you refuse to take an alcohol test. Both lanes of traffic are going in the same direction. Passing is permitted when it's safe. Dashed yellow lines separate single lanes of traffic moving in opposite directions. Passing is allowed when there is no oncoming traffic in the passing lane. 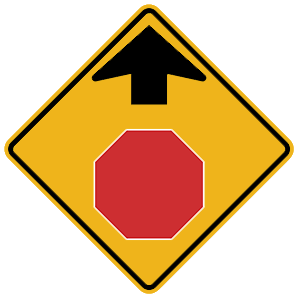 This sign indicates that a stop sign is ahead.